Iron Workers Local 704 Apprenticeship program provides apprentices with the skills, knowledge, and training necessary to be safe on the job site, competitive in the workplace, and satisfied in their careers. We provide our members with knowledge and skills ranging from basic to the very advanced for becoming a Journeyman Iron Worker. Our program is a four year program. Each Apprentices will attend day school four full weeks during the school year. Apprentices are encouraged to begin working for/with a signatory contractor as soon as possible to obtain on the job training in conjunction with attending classes at our training facility. DO YOU HAVE WHAT IT TAKES? ARE YOU IRON WORKER MATERIAL? Do you like to be able to see the work you’ve done at the end of the day? Are you willing to do physically demanding work that requires you to use your mind? Would you like to earn a respectable wage while going to school to learn new skills? If you’re nodding your head “yes” to the questions above, we encourage you to read the requirements and apply for the Iron Workers Local 704 Apprenticeship program. An apprenticeship program will provide a way to achieve the success you’re looking for. It is important to mention that an Iron Worker must be willing to work in high places, have a good sense of balance, and be alert to potential danger to themselves and others. However, the apprenticeship program includes safety training with OSHA Authorized Construction Trainers so that the danger is minimized. Additionally Iron Workers must be drug free and willing to submit yearly and random drug screenings upon request. Call the Iron Workers Apprenticeship Program at (423) 698-4198 to schedule an application completion appointment/interview. Arrive to your interview on time and prepared. Allow yourself enough time to complete an application with references & take an assessment test (the assessment test is used to rate you in the program). Bring the following documents to your interview: Current drivers license, high school diploma/G.E.D., social security card, birth certificate, any certifications; veterans should also bring a copy of your DD214. Go to our authorized drug screening facility and submit a drug screening sample. 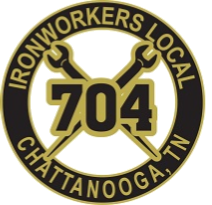 Join Iron Workers Local 704 membership. Attend OSHA & Standards of Excellence Training.